This pallet wood recycling is literally a sort of addiction, people come towards the wooden pallet recycling, and they become addicted to it as the time passes by. Same is the case with me and my entire team, we just started this as a time pass and with basic motto to discourage the cutting of trees. But now we are always desperate to explore and work on some new wooden pallet upcycling ideas. And you guys are our inspiration who keep us motivated. 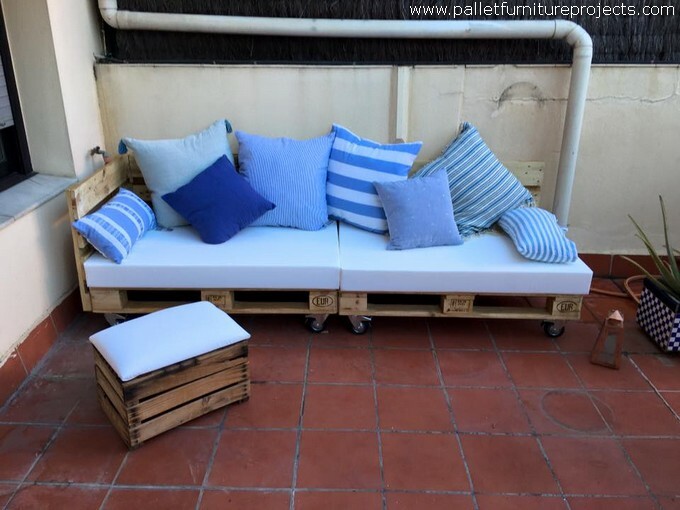 How do you think about this wooden pallet recycled sofa that we are presenting here? 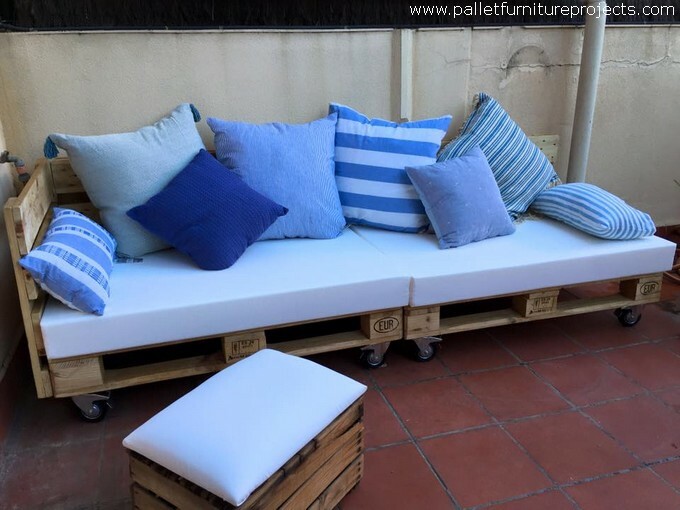 Before we start discussing the structure of this pallet wooden couch, I would like to comment on the usage of this splendid wooden furniture item. Well, honestly speaking, I would prefer this rustic wooden couch a hundred times over an expensive market based wooden couch bought against hundreds of bucks. And I also believe that in none of the ways this is any lesser from those market oriented branded wooden furniture items. It has got all what could be expected from a smart furniture item. No matter the quality of shipping pallets isn’t of that high quality, but this still made a commendable item. Do you see the tiny table too? 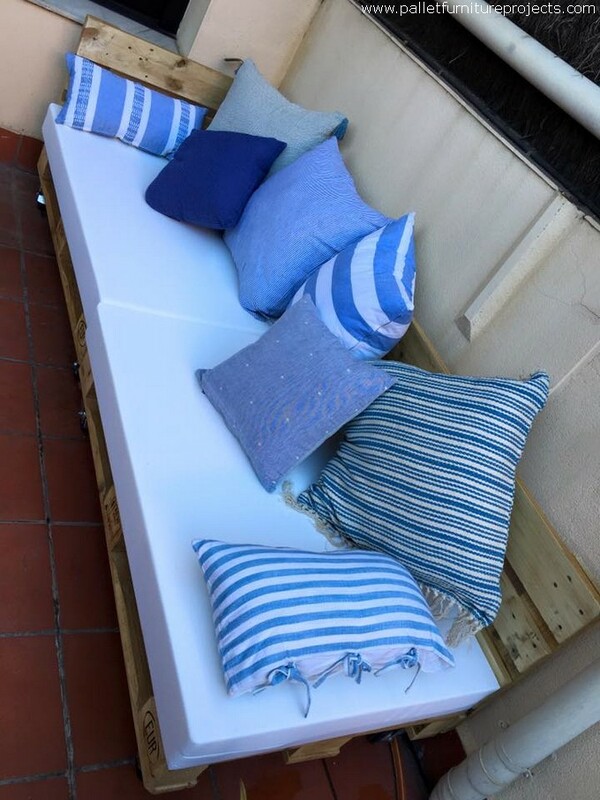 The one that we have placed right in the front of the pallet recycled sofa? This was made especially matching to the sofa in looks, structure and design as well. The wheels on the base are certainly with the purpose to shift it to any other sop very easily. Having a deep look inside the basic structure this is pretty clear that two whole shipping pallets are combined together, and on one side we have also added a support, this is kind of fashion. Now come and sit or lie down on it, enjoy what you have created at your own.